According to the Alzheimer’s Association, over 5 million people are currently facing the hardships of Alzheimer’s in the United States. The illness corrodes a victim’s memory, making it incredibly difficult and frustrating to connect and communicate with family and friends. The goal of such a coloring book is to help calm patients and caregivers together, thus facilitating better connections between family and friends. Images in the book are inspired from Shriver’s visits to nursing homes. The product also includes tips for caregivers within its pages that are based on conversations with doctors and families. Dr. Richard Isaacson, director of the Alzhiemer’s Prevention Clinic, explained that “the person with Alzheimer’s may not be able to communicate his or her thoughts as well as they used to or may not remember what happened to the conversation 10 minutes ago, but they’re able to express themselves through art – through drawing.” The emergence of this coloring book could help to fulfill this unmet need for better communication. 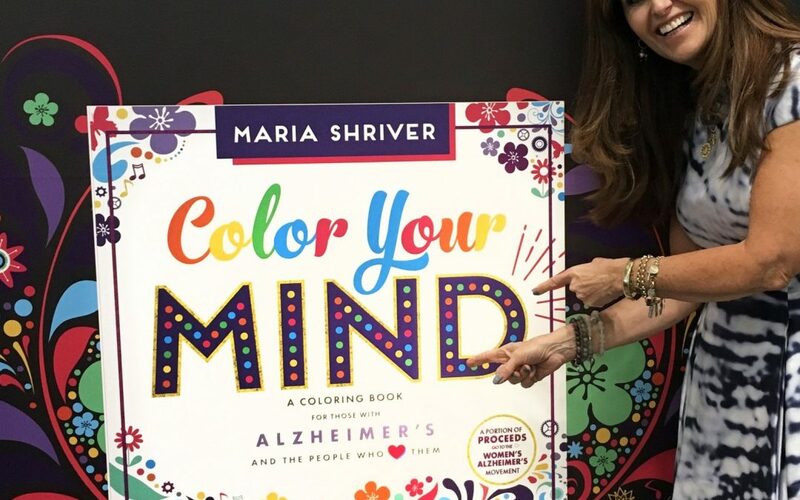 Shriver noted that Alzheimer’s is an intense, frightening experience, and she ensured the coloring book focused on happy, hopeful, themes through numerous colors and images of butterflies and happy people. The coloring book was released in June, which is considered Alzheimer’s and Brain Awareness Month.